Welcome to our Ischia blog, Good Morning Ischia! Here you can see the entry for Tuesday 8th October 2013. It's a bright and sunny start to the day in Ischia with temperatures set to reach 24 celcius/76 fahrenheit in the afternoon. The weather forecast is predicting a few spots of rain later but right now the skies are clear and they may just have got it a bit wrong, we'll see! 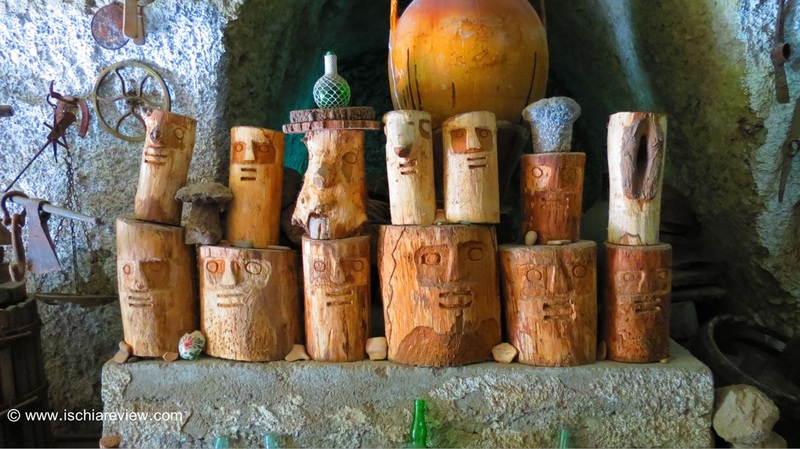 Today's photo is of some wood carvings at the Casa Museo between Barano and Serrara Fontana. The house museum is the home of Salvatore di Meglio who has created a fascinating environment, full of farming tools from many years ago, wood-carvings like the one seen in the photo and mosaics made from pebbles and sea-shells. The house is carved out of the local tufa stone which is also used in many cellars on the island to keep wine and produce at a cool temperature. A series of tunnels have also been carved out of the stone, leading to different rooms or outside balconies, making for an intriguing tour around this house full of curiosities. Located on the main road between Serrara Fontana and Barano it's impossible to miss the Casa Museo as outside sits the unlikely sight of the Egyptian Sphinx! The Sphinx was used to take part in the Festa di Sant'Anna a few years ago, to represent the movie history in Ischia which includes the shooting of the film "Cleopatra" with Liz Taylor and Richard Burton. Entrance to the museum is free and if you like what you see you can leave a small tip to give thanks. Wherever you decide to go in Ischia today, have a great day and feel free to drop us a line at info@ischiareview.com if you've got any questions about the island.